To better understand what’s happening in this great country, let’s all engage in the metaphor of the day! 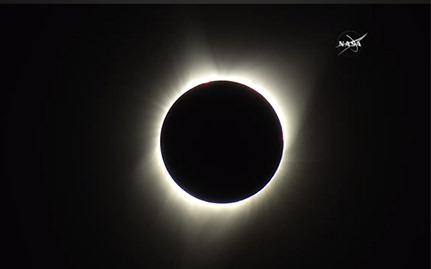 The total eclipse of the sun will be over in less than three minutes. 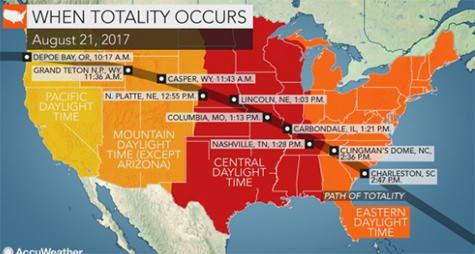 But take off the glasses, open your eyes, and see the real eclipse that’s going on over the entire country. That would be the Trumpian eclipse of logic, moral values, and democracy. We have a little more than three years to go–though the bookmakers at Ladbrokes in England will pay 11/10 on a prop bet that Trump leaves before the end of the first term. That’s about a 48 percent chance. I say it’s likely to go higher if good people step up and condemn the president for his moral lapse; higher still, if Trump fails to recant his recanting of his Charlottesville remarks. 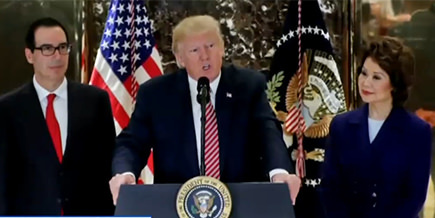 Once again, you’ll recall Trump half-heartedly denounced the white supremacists a week ago Saturday, then fully denounced them by sticking to the prompter on Monday, then went back and reclaimed his support for those “fine” neo-Nazis and white supremacists on Tuesday. All with our Asian American cabinet member Transportation Secretary Elaine Chao standing by him, apparently brought in to talk infrastructure, but in reality used as a diversity prop, next to two Jewish administration members, Treasury Secretary Steve Mnuchin and economic advisor Gary Cohn. Did Trump say there were “fine people” among the white supremacists and anti-semites? As he spoke to the media, Trump had the “some of my best friends” defense on display at the ready. They should all speak out against Trump, if not abandon Herr Orange. After the post-Charlottesville display of political and moral bankruptcy, how can anyone say Trump is fit to be president of the United States and leader of the free world? And don’t let Trump folks claim the firing of Breitbartist Steve Bannon will make any difference. Trump showed he was a racist long before Bannon, who had nothing to do with Trump’s stance on the Central Park 5. Nor was Bannon a part of Trump’s unrelenting birther attack of President Obama. After Charlottesville, Trump’s going birther on the rest of the country. Don’t make the mistake of thinking this is strictly a black/white issue. He thinks we’re all inferior. That’s why the white supremacists adore him. Trump makes it possible for them to take off their hoods and come up for air. I’d rather they suffocate from hate. As I said in my last column, Asian Americans know the sentiment behind exclusion. The Chinese and Japanese definitely do. Just think of the iconic hate crime victim, Vincent Chin, a Chinese American mistaken by an American auto worker for being Japanese. Filipinos also know what it’s like to be seen as a threat to the work force. My father came to the U.S. as a colonized national in the 1920s and saw firsthand how Filipinos were subjected to the violence of white nativist politics. You see, back in pre-Tinder America, Filipinophobia was definitely a thing. And it led to violence throughout California, including lynchings (yes, Filipinos lynched! ), and a massive riot in Watsonville after a white mob shot and beat Filipinos who hired white girls for a dance. After four days of rioting, Fermin Tobera was found shot dead with a bullet to his chest, January 22, 1930. Anyone who has studied Asian American history knows Fermin Tobera. He’s proof Asian Americans know the hate that claimed the life of Heather Heyer in Charlottesville. It also means there’s no question that Trump must come forward with greater clarity. The white protestors and counter-protestors at Charlottesville are not the same. I’ve already heard people dismiss counter-protestors as “politically correct.” No, they’re just morally correct. The counter-protestors are for inclusion, and equity in general. This is the point of diversity, and the point of America. “In many one,” right? It’s not E Pluribus, Just Us. The KKK, hoodless or hooded, have a right to free speech. But the organization’s philosophy and ideals are indefensible and anti-American. That’s what a leader of the free world needs to say if he wants to stay in office. He shouldn’t try to change the subject and talk about Afghanistan; or start campaigning like he’s done something these last eight months, and try to forget Charlottesville. We must never let him forget Charlottesville. Or force us to live a second longer under a Trumpian eclipse of American values.